For those of you who believe in the prevalence of good over evil, the allegory of Twelve Angry Men might take on a deeper significance, as a jury fiercely debate the guilt or otherwise of a defendant in a seemingly open and shut first degree murder case. What seems like a foregone conclusion as the twelve jurors enter their fragmented and heated discussions loses its shroud of inevitability as the men begin to look more closely at the case for the prosecution, exposing its inconsistencies and at times plain inattention. Twelve protagonists retire to the jury room eleven of whom have already reached a decision as to the guilt of a slum boy accused of murdering his father. The one man who stands against them is left with a battle to convince them that their decision is not only wrong but in some cases borne of pure prejudice. A dozen very different characters, ably played by actors like George Voskovec and Jack Warden, complement each other to turn each page of an adventure which takes place in a single room, around one table and with one purpose. Whether by means of gentle persuasion or very powerful reasoning, the originally solitary and ostensibly ridiculous plea for not guilty convinces each of them one by one that the case for the prosecution was flimsy and the lawyer for the defence was little short of incompetent. The film culminates with all twelve accepting that their presumption of guilty cannot be taken to the judge without reasonable doubt, and they return a verdict of not guilty. A simple story, possibly a little over-acted in places, based around a single plot (i.e. no sub-plots) but with a detailed picture of human behaviour both admirable and repugnant, the original version of Twelve Angry men is a beautiful reminder of how good shall prevail from however small a seed it grows. Lacking only is a courtroom scene where their verdict is delivered, but the director will have decided not to include this with good reason. And who’s to argue with him on that? Take a trip into the plausible fantasy world of young Billy Ingham, a 15-or-so-year-old youngster on a mission to establish a comfortable, but not boring, life away from the hassles of his natural parents. After an unsettling first decade and a half, Billy is unceremoniously dumped at his grandparents’ farm by a starry-eyed mother with a home in the south of France on her mind, and a father with nothing but money on his. But it’s not as bad at it seems, and Billy, joined by his canine companion (the unfortunately named Twiggy), very quickly finds his feet in the North Yorkshire countryside. A developing sense of self-worth, underpinned by a similar fresh sense of belonging (and actually for perhaps the first time ever, feeling wanted) nudges Billy out of the door with a braver curiosity than ever before. And through the eyes of a yet fragile but emboldened teenager we are taken on a journey into a world where believable characters and almost, dare I say, simple storylines by their very essence become the magic of the adventures. Simplicity does not need to be bad, we don’t need to leave our comfort zones to experience adventure, nor to feel that we are learning something new. While Harry Potter casts spells and defeats evil, Billy Ingham just does the normal teenage boy things... no magic potions, no broomsticks or dragons. Just boy, dog, and a host of other people you could meet in your own high street. Supergeek is Peter Ardern’s opening move in this series which I dearly hope will become a protracted contribution to English literature. It focuses on Billy, but it takes half the book to discover that Billy is not in fact the geek named on the cover but that this tag belongs to another, well, I won’t spoil it for you. Ardern leads the reader skilfully through the story and his decision to jump entirely to the sub-plot around Chapter 6 leaves you feeling happily eager to find out more. You are not to be disappointed. The sequel, The Whitby Dancer is similarly adorned with plot and its sub-counterpart, but as with Supergeek the denouement is withheld until craved. The skill of a writer is not just in delivering a punchline, but preparing you for it and removing from you an impatient desire to wrap things up before you’ve taken in the plot along the way. Peter Ardern has a natural talent for this. Put it this way, at no point was I tempted to read the last page before I reached it! For me, that’s saying something. The magic of the Billy Ingham series is the way in which it takes you on an adventure without taking you anywhere. You are able to identify with the character without undue imagination, but marvel at the imagination that has been put into such gentle storytelling. I felt I truly lived through these stories. I loathed the avaricious father, felt reassured by the rock-steady grandfather and pitied the misplaced vanity of the wannabe-folk-groupie mother. As for Billy, I feel I have made a new friend. I look forward to more, perhaps if the TV guys have any sense they’ll realise this return to basic human values is a direction well worth heading in. If not, well, I say we fly the flag ourselves. All three series, coming soonish. THIS REVIEW IS OF THE WICKER MAN 1973, NOT THE NICHOLAS CAGE REMAKE. This review contains not only spoilers but complete ruination. Barry Norman’s answer to very burnt toast. Hold your nose, cover the smoke alarms, open the windows... or go back to the darts page and read about Anastasiya Dobromyslova. For various reasons, The Wicker Man had a very tough time even getting to the cinema. It was either too short, too strange, too irrelevant or according to some, just too poor. It depended who you listened to. I think they even lost some of the original film, and no, it’s never been found. Rumour has it these outtakes are buried somewhere beneath a British motorway. Back in 1973, that’s where many of the critics would have sent it all, and it only made it onto the screens thanks to a conspiracy of fate. So how did this ‘shambles’ of a production go on to become a cult classic, and one of the most popular British films of all time? Simple, it spoke to the reclusive and elusive nature in many of us. Marketing men in grey suits aren’t as in touch with the common man as they think, and the Wicker Man’s appeal was something they had no way of identifying with. And the secluded Scottish island community was almost symbolic of many people’s dissatisfaction with and desire to escape the drudgery of suburban England, a society no longer in change, after the promises of the 60s became the broken promises of the 70s. The Pagan rites and rituals of the island’s inhabitants became a focus for those desperate to break through the walls of an over-organised society into a freer world, and the magic of the soundtrack gave the atmosphere an even more profound and uplifting sense of purity. And so that tiny Scottish island was far more than just a setting for an interesting and unpredictable story, it came to represent a world so many people wanted to live in. A police Sergeant from mainland Scotland is summoned to investigate the disappearance of a missing schoolgirl on Summerisle, off the west coast of Scotland. What seemed like a routine case is confused firstly by the islanders’ collective denial of the girl’s existence, but also by the discoveries the remarkably over-zealous Sergeant Howie makes about the locals and their peculiar religious and social rituals, ultimately leading him to the conclusion that the girl is being held as a human sacrifice ahead of the impending May Day celebrations. Ostensibly the islanders want him to keep his distance, but control his every move and thought with complex mind games and trickery, sabotage and temptation. The fertility of the plot is matched by that of the sub-plot, the interaction between the pub landlord’s temptress daughter and the neurotic policeman, immediately enslaved by his desire for her - her song to him only enflames the conflict within him even further - but restrained by his faith, a tribute to the futile morality he represents in the film. The leading actors, Edward Woodward and Christopher Lee, the latter taking a break from playing Dracula in yet another Hammer production, complement each other very well as Sgt Howie and Lord Summerisle, the author of the mystery which ultimately does see a sacrifice to Pagan deities, only, not of the missing girl central to his investigation. Asserted Lord Summerisle, “The sacrifice of the willing, king-like, virgin fool will be accepted”, and the devoutly Christian policeman is offered to the Queen of the May and burnt, alive, in a giant wicker statue along with a few goats and smaller animals. Fans of The Wicker Man identify with how the film and its content rejects convention without actually striking out at it. Instead, it is a hidden assault on the mechanics of ordered society, and the ultimate gesture they make to nature is really only symbolic of how, deep down, many of us would love to out-think, out-manoeuvre and out-run the system. And while flaming torch and wicker may not be the way we’d really go about it, this climax to a wonderful film remains to this day a very powerful metaphor that has serenaded so many for so long. Italian writer Tiziano Terzani is the type of writer who galvanises your interest in things which may not under normal circumstances be of any real interest to you. 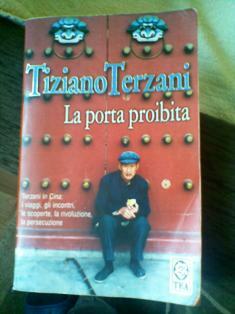 This book details the, it must be said, negative, experience of Terzani in China where he lived for many years while working as a correspondent for the German publication, Der Spiegel. I actually read this non-fiction book in its original form, La Porta Proibita, after a student in Italy gave it as a gift. Her verdict was that his style was non-complicated and was in many ways a vehicle to express many of the same types of views that she had come to associate with me after a year in my classroom. While in no way do, nor can I agree with everything Terzani says in the book and elsewhere, I still regard this conclusion as quite a compliment. I don’t think the same would apply to writing style though. I often try to write almost cryptically, in a way which challenges the reader and even the language itself. It’s a trait common in writers, especially the younger generation of literary egotists determined to wave their prose like a form of desperate semaphor hoping to get noticed. Journalists and their idiomatic phrasal verbs, coined for the very first time to further their careers. Maybe Tiziano Terzani started out like that himself. Yet in La Porta Proibita his words do the talking, not the way he styles them. He writes as if he’s got nothing to prove to anybody and just like the good football referee whom you don’t notice during the game, the camerawork never betrays the film. The book is about China during the period between the Communist revolution in er, 1949, and before the more recent economic boom (about which Terzani never had chance to write. He was expelled from China sometime in the 1980s). And he doesn’t pull any punches. We are left in no doubt as to whether he thinks the Communist regime benefitted the country and its people, and nor are we left in any doubt as to who he blames. Obviously he writes from a very biased perspective but offers more than scant evidence to back up any claims he makes. But page after page it is a spewing of bile, a spleen venting, liver emptying rant against those who had, as he sees it, taken the heart out of a once very proud country, the paint from a very sturdy canvas. And yet he’s not anti-China, rather very pro, even claiming to have tried for several years to feel truly Chinese. His gripe is with the political bulldozer which has reduced it to system. Organisation has taken the place of inspiration, while so many dreams have been shattered by the fundamentals of corruption. Or so he says. Take or leave his views, but he’s worth reading.